I had just finished up one of the wildest years of my life; after graduating college in May 2012 I had to move to St. Louis for one year of on-the-job training before being allowed to return to Kansas and work in the corporate office. Within that span of 12 months I also got married, went on a couple pretty cool vacations, had disposable income really for the first time in my life, and (eventually, coinciding with my return) bought my first house in Topeka. In the previous12 months I'd become obsessed with the Topps '56 and '59 baseball card sets. Topps '56 was Jackie Robinson's final year, Luis Aparicio's first, features one of my favorite old-school card designs, and was also the year my dad was born. Topps '59 featured a Bob Gibson rookie and, as you might guess, represents the year my mom was born. After we'd moved into the new-to-us house and the dust settled, I decided to treat myself. After scouring Check Out My Cards and eBay for hours, I found the perfect fit. 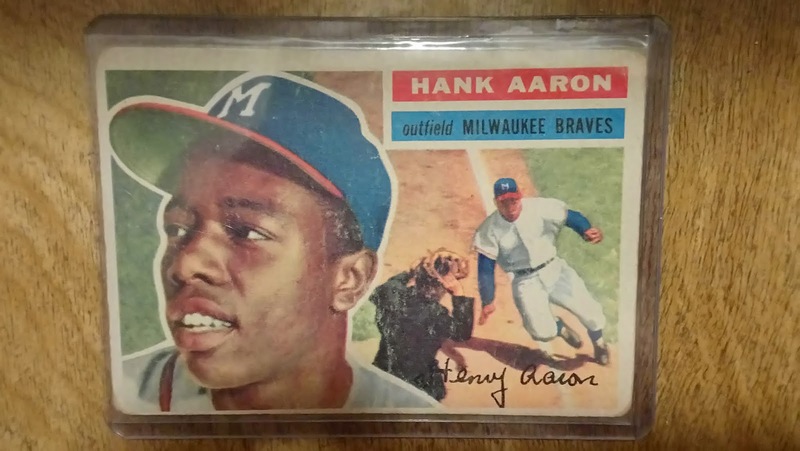 It had a small crease and rough edges (two things I forgive readily in older cards) but was priced appropriately and, most importantly, displayed a picture of Hank Aaron. I hadn't settled on this card before-hand; I was simply looking for something higher-end within my two favorite sets that met my middle-grade standards for physical condition standards and a dollar amount established by my beautiful wife. I pulled the trigger immediately. Today Hank sits on my shelf next to the '89 Pro Set Fred Marion error card as my two easy-favorites (meriting a post of its own). Some of my fervor for sports cards has been replaced by other trading card games and video games in recent years, so my '56 collection has grown little since; the Ted Williams is the biggest missing piece at the moment. However, most times when I see this card proudly displayed in my wife and my "hobby room," I think about that whirlwind of a first year away from school and in the real world, as a married man and a homeowner and so on, and how in hindsight this card feels like the finish line.